The Legacy slot machine is one of those options that is hit or miss with players. It's a classic three-reel, five-line machine with a simple theme based on luxury in deep reds and chrome. 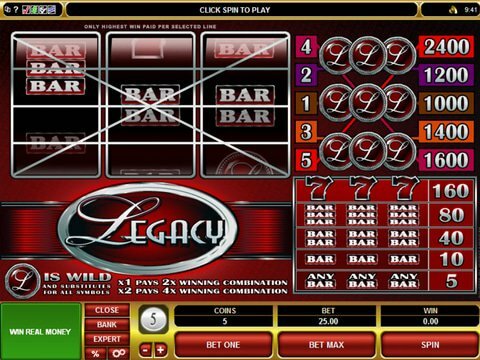 You can review it right here on this page with the Legacy free play slot demo that is available to you with no download and no registration, and you can also check it out from your computer or your mobile phone - whichever fits your desires the best. Getting started playing this Microgaming video slots machine is easy since all you have to do is pick your per-spin wager amount, and this could be as little as $1 or as much as $125 - quite a bit for a machine like this. The top jackpot here is $60,000 depending upon the coin you choose, and these climb all the way up to $25 in value. The features here are few and far between, but the L is wild and will substitute for anything else to help you create winning combinations. When it does, it will double or quadruple the win depending on whether one or two were used. The L is also the jackpot trigger whenever three of them line up on the fifth reel. If you like the luxury theme but you're more of a real money gambler, then the Double Diamond slot from IGT is a better choice. It takes place on three reels also, but it has only a single payline. It has a luxurious feel with a royal purple theme, and the Diamonds truly are your best friends here as they not only act as wilds, but also produce the $2500 jackpot if they happen to line up on the payline. There are frequent wins with this one, so it's more likely that you'll at least break even at the end of your gambling session.